Free DAT sample questions have been placed in our free DAT practice test constructed by Gold Standard DAT to help you simulate the real exam. This is a timed mini-test experience containing sample questions from all DAT topics including the Natural Sciences (biology, general and organic chemistry), the Perceptual Ability Test (PAT), Quantitative Reasoning (QR) and Reading Comprehension (RC). This free DAT practice test can be used as a diagnostic practice exam since it provides instant scores, helpful DAT sample questions and answers with clear explanations including some short DAT PAT videos. Your account also includes a new free DAT sample question automatically added to your Members home page as part of the following free online features: Gold Standard DAT Question of the Day, Science Review Video of the Week, and Natural Sciences Summary Pic of the Week. 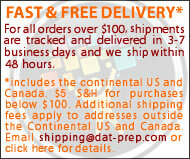 To register, click here: free DAT practice test. 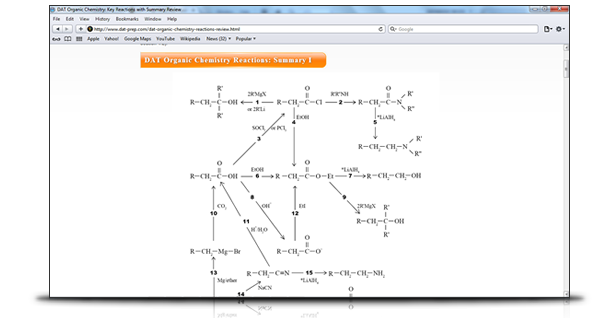 Organic chemistry is one of the few DAT subjects that can be effectively summarized. We have created a free DAT prep page with an organic chemistry summary with the main reactions, the official ADA topic list for organic chemistry and our suggested org. chem. preparation book (study guide) and videos. To learn more, click here: DAT Organic Chemistry Reactions. 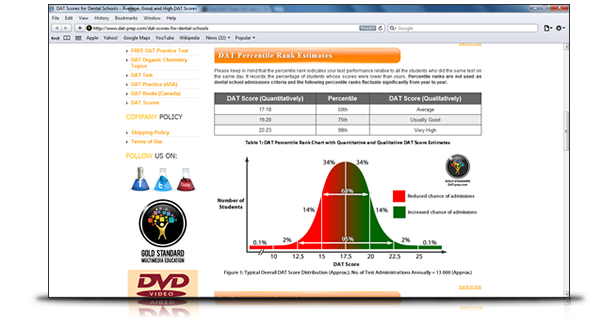 Gold Standard DAT has created one page explaining how DAT scores are calculated, the meaning of your scores and percentile ranks, and most importantly, the average DAT scores and GPA requirements at all US dental schools to give you a clear indication of your real exam score objective. To learn more, click here: DAT Scores for Dental Schools. 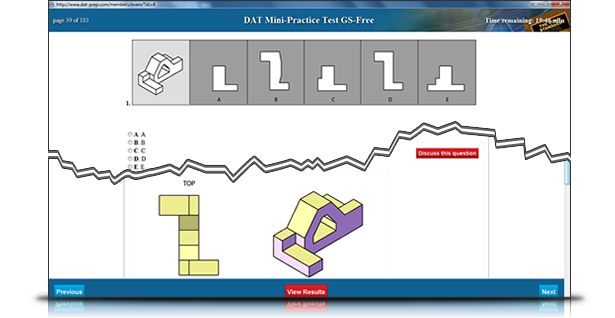 This free DAT PAT practice test by Gold Standard DAT provides 30 PAT practice questions, which is one-third of the real exam. You have an option to simulate the real DAT exam interface, format and scoring or view the questions on the page. Both options come with answer key and explanations. To learn more, click here: free DAT PAT Practice Questions.